The glorious sunshine this past weekend has reinforced the fact that spring is now finally on it's way. My windowsills have been full of seed trays for the past month and despite a cat and a one year old constantly trying (and occasionally succeeding) to dig up what inside, I have actually manged to grow a few things. 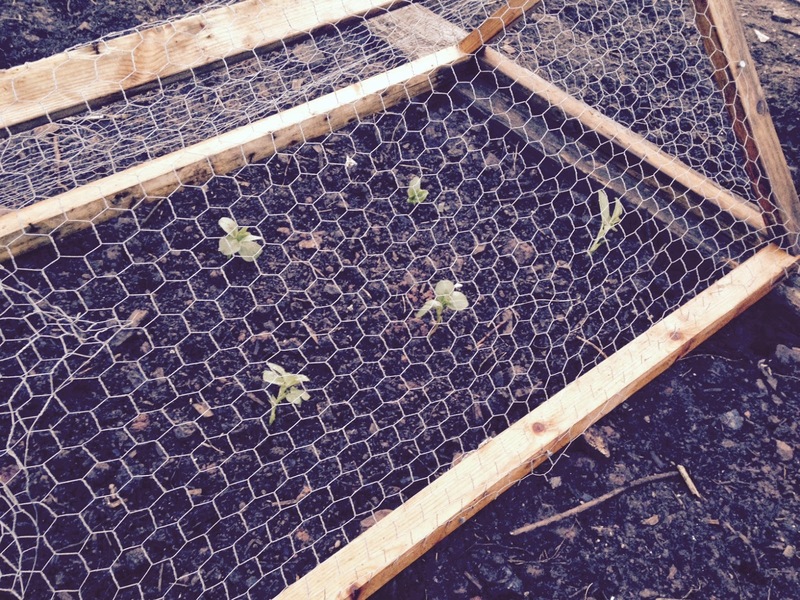 Six broad beans plants were planted into the new veg patch yesterday with another four seeds sown directly alongside. Looking back through the blog at this time last year I was doing exactly the same thing however I have learnt a few things. 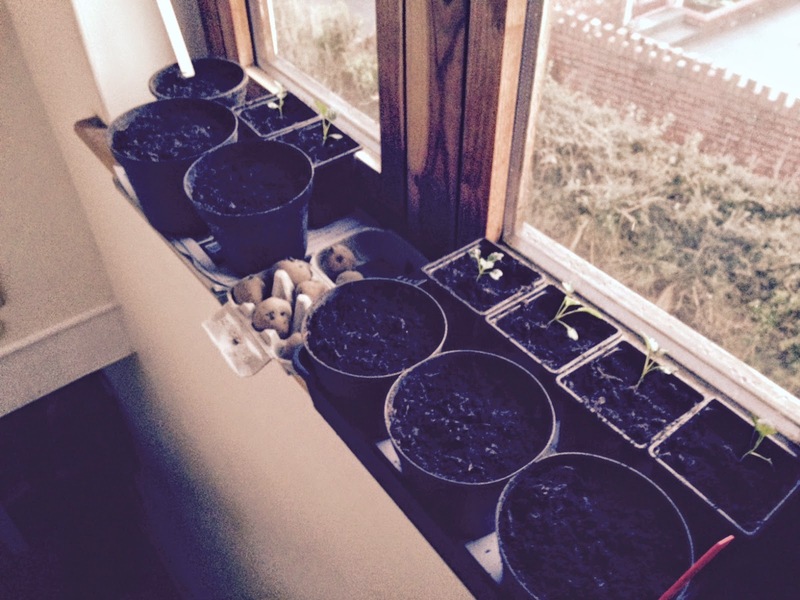 The beans were germinated on a much sunnier windowsill which has resulted in much shorter, stronger plants. Last years grew too tall due to not receiving enough sunlight but being the first year that I had grown them I was blissfully unaware that they weren't meant to look like this. they blew about so much in the wind after planting out that in a week there was nothing left of them. This year the plants have been placed outside to harden off during the day and brought in overnight for the past week. For the past two days I left them in a sheltered spot outside the back door to fully acclimatise prior to planting. Another improvement is the quantity, broad beans freeze so well that I might as well grow a load at once and use the space for something else afterwards. I'll sow another large batch later in the year but there is no point trickling them out as I tried to last year. The same goes for other things such as onions, French beans and peas. a couple of large sowings should provide plenty of fresh veg and also plenty to store. At the opposite end of the scale I have sown the first of this years carrots. These will be successionally sown and have been planted in rows with spring onions in between. The idea being that the scent of the spring onions should overpower the carrots and put off any carrot root fly. I have gone for three varieties initially, just what I had left over from last year. I'll see how these get on and decide whether I need to buy any more for sowings later in the year. To ensure perfectly straight carrots I've added plenty of sand to the soil in what was the old polytunnel bed. Manure was added to this last September followed by a brassica crop that was devoured by the ducks after the polytunnel blew away. There should be the a good amount of nutrients left in the soil and hopefully it's sufficiently incorporated to not hinder the carrots growth. If the soil had been recently manured I would expect to see forked carrots due to the roots going in search of the best soil. To fill a gap in the raised beds I have filled one with early peas. these will hopefully be harvested during June and once past their best will come up ready for something else to go straight in. the good thing about all legumes is that they actually fix nitrogen into the soil rather consuming it as other plants would, this means they'll be very little soil preparation following these. Preparing the soil has been my main task over the past couple of months. Last year I dug everything over as best as I could, removing any stones and breaking up the clods of soil as I went. The soil wasn't too bad, not great but good enough. Some things did really well and others never really took off. Since then I have had two compost heaps on the go and have gone compost mad. Literally anything that is remotely compostable get put in the pile. Interestingly the one that is out in the open surrounded by wooden pallets has produced much better compost than the other big plastic recycling bin that cost me fifty pounds. I suppose it makes sense, one pile is easier to turn than the other and has had ducks and chickens digging it up looking for worms while the other has remained largely untouched. Worth noting though before anyone goes out and buys one that a pile in the corner will achieve the same effect quicker and for free. The plants will now be going in thick and fast with potatoes chitting, kale, chard, leeks and onions all growing on the windowsills. Since the polytunnel blew away I've lost a valuable place to get things started but that's not going to slow me down. Where possible I'll sow direct and as long as I can keep the ducks and chickens away, with the groundwork that I have already put in, the garden will hopefully thrive this summer.